Hello everyone....hope all is well with you. 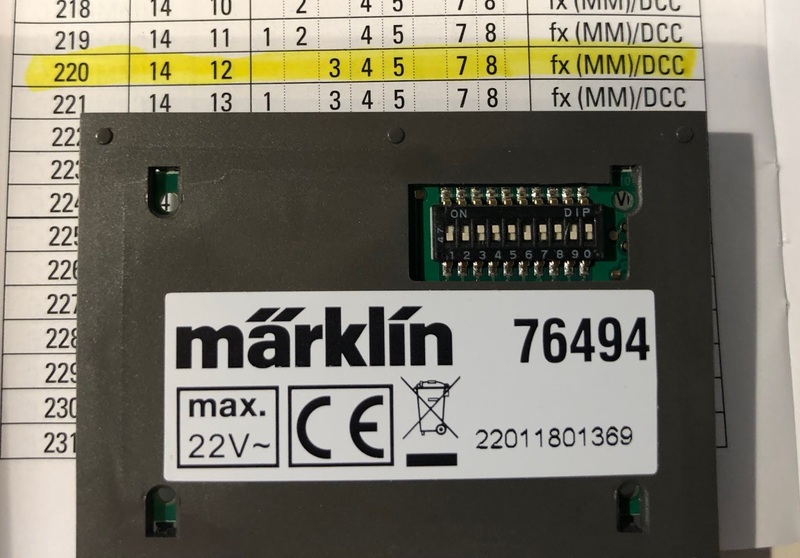 This blog entry focuses on how to program mfx Marklin signals ( 76xxx ) onto the CS3! After returning from a two month hiatus visiting grandchildren, I stumbled once again as I attempted to program new signals for the layout. 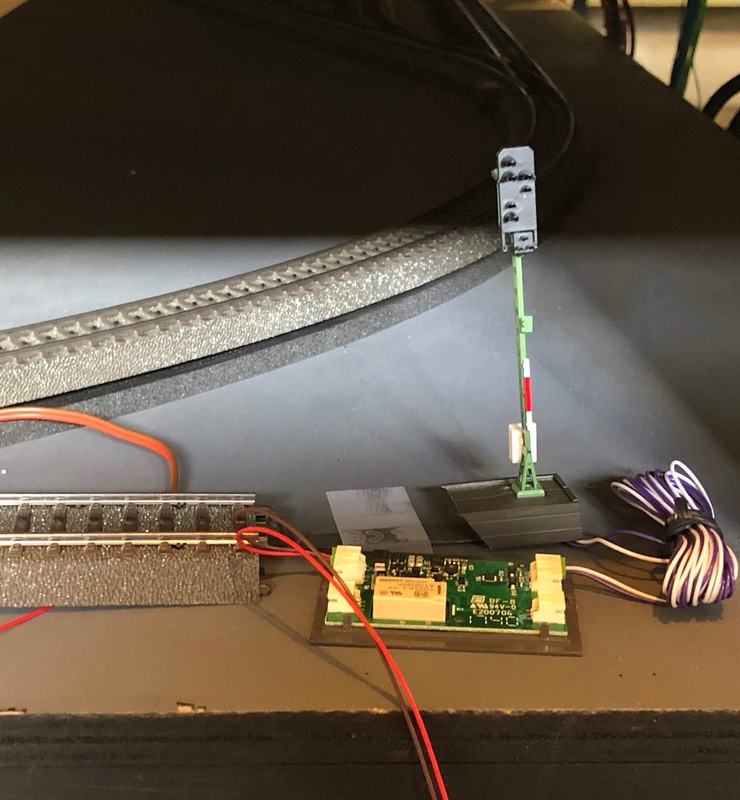 I had documented the basic steps, but forgot an important sequence in the programming and thus I had to experience a "refreshment" of the "learning curve". 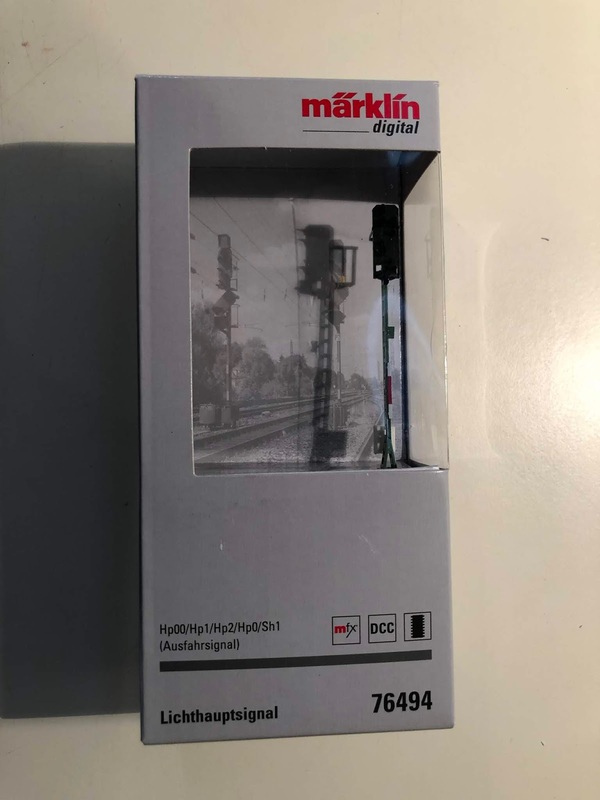 Basic "first class" Marklin packaging. Remove contents! 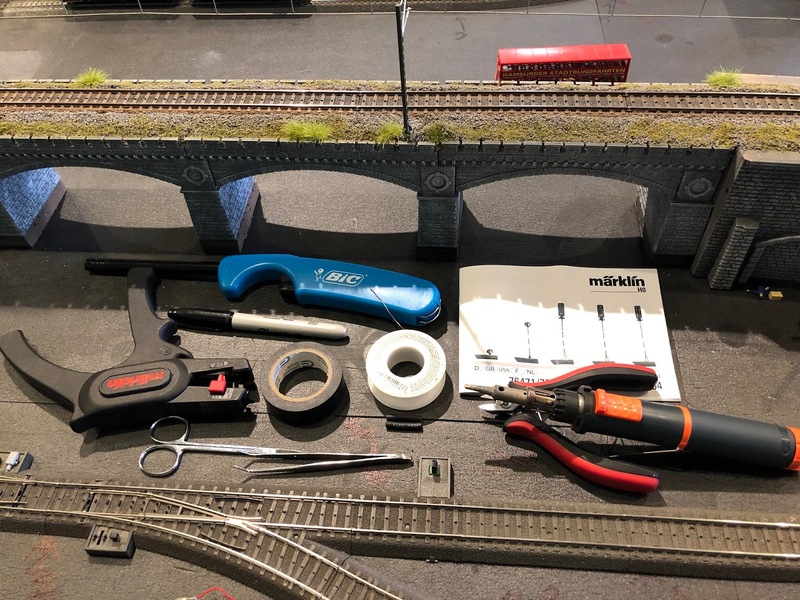 Programming the 76xxx series differs significantly from the previous Marklin series of signals. 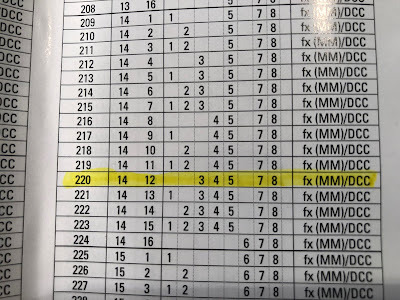 The enclosed brochure lists all the possible codes. 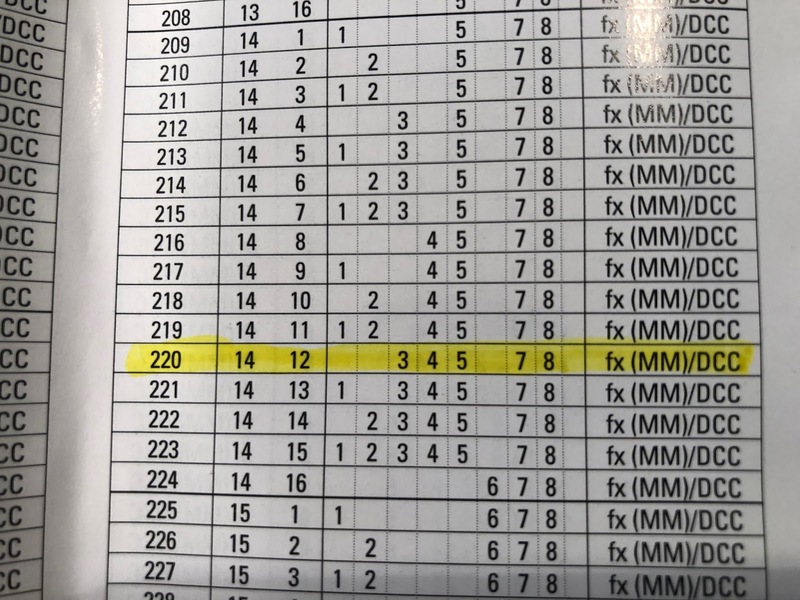 I will program this signal to # 220 on the CS3....in other words, there are 219 available slots ahead of this position. 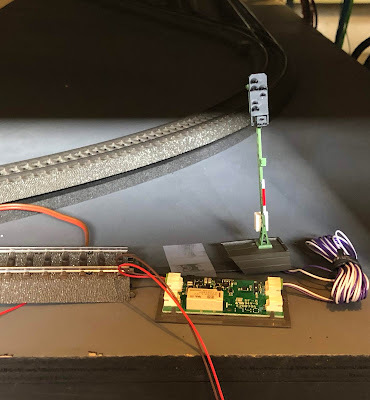 The circuit board. 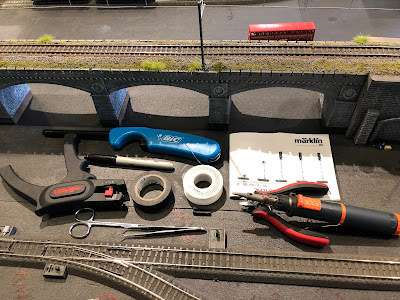 Toggle # 1 is in the on position per Marklin. 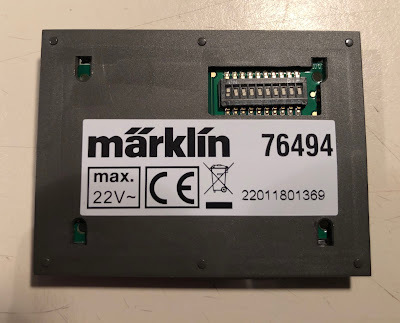 Circuit Board now programmed to the digital code. Note that the #10 is in the "on" position! 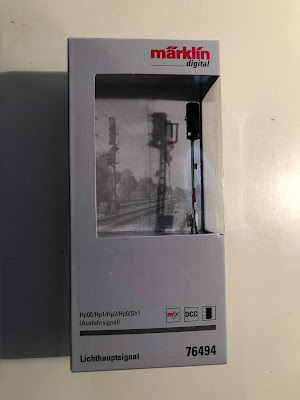 I am programing all my signals with the DCC format as recommended by the "Marklin Dudes", and also exemplified in the "manual" Item # 03092. Page 49-52. The # 10 must be on for programming in DCC. 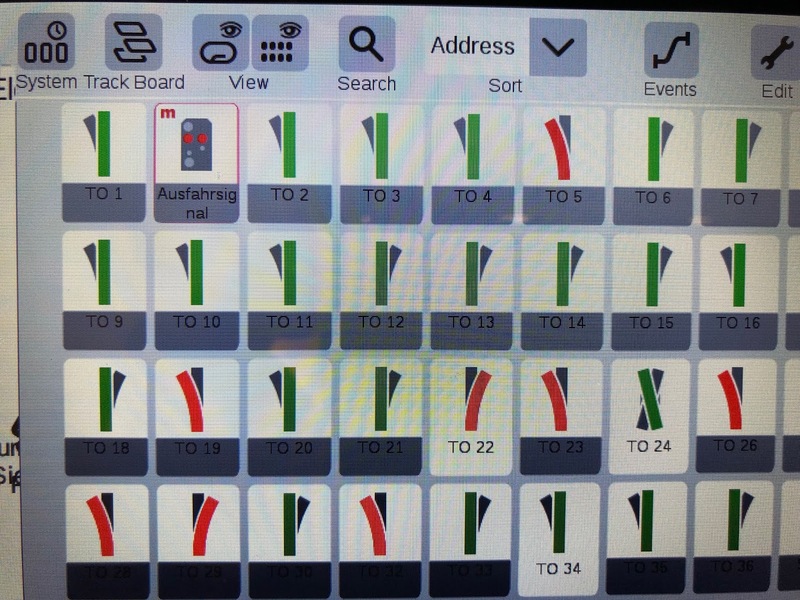 My programming track is located in the staging yard. I ran auxiliary R/B wires to an extra piece of inactive track, to which I can then connect the Signal's R/B power spades to the track. Now we're ready to begin programming to the CS3. 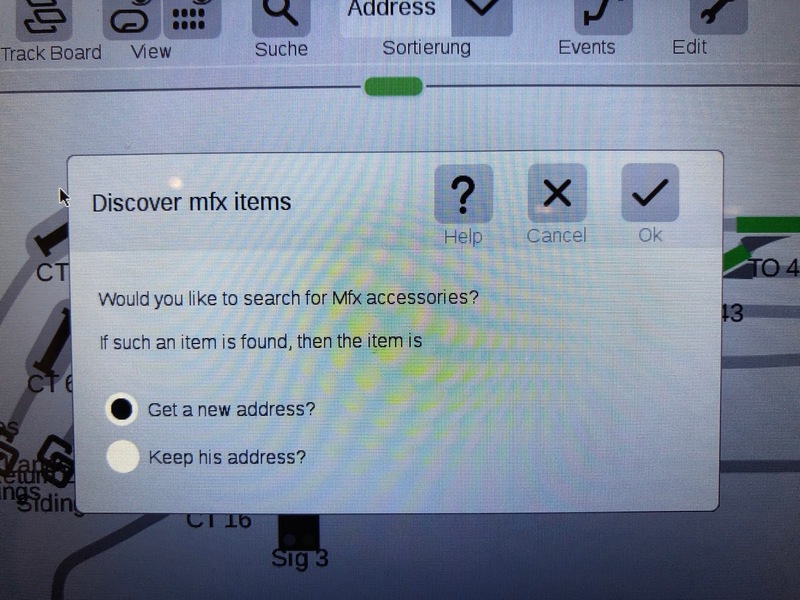 Click on the "Edit" tab, select "Discover mfx items". 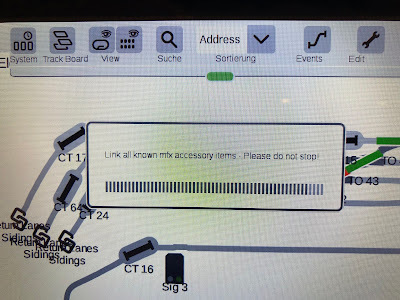 Click "ok" for the CS3 to search for the NEW mfx item...namely our mfx signal connected to the programing track. This "magic" box appears ....the CS3 is searching for our new signal circuit board. Now this is where it can be confusing....the new item ....our signal icon, appears at the beginning of the "article list" cue......NOT next to all the other signals previously programmed into the CS....why?---because we have not yet assigned an ordinal number for the cue list. 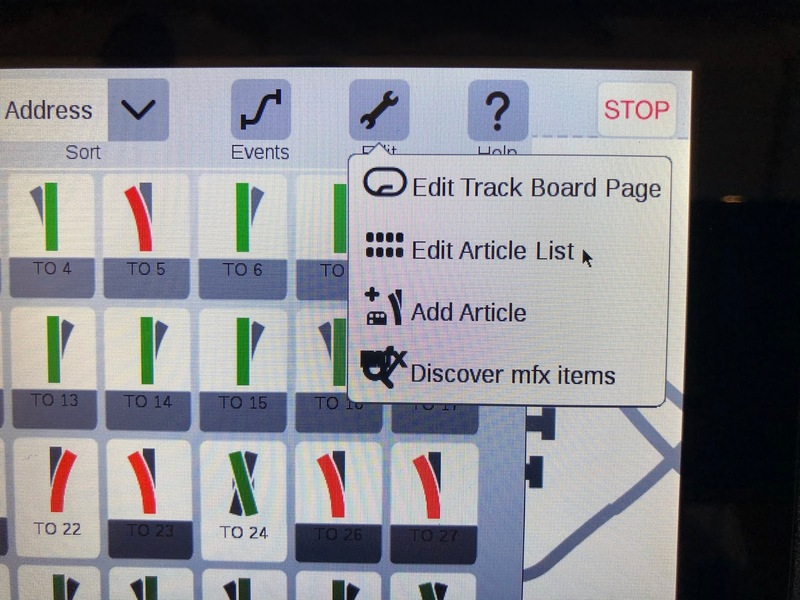 Note the little red "m" next to the new icon...this means that this article is an mfx item. Click on the "Edit" tab once again and select: "Edit Article List" . 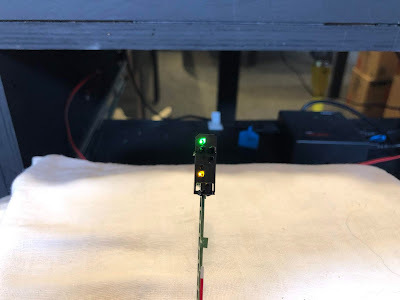 Remember that at the end of this process, if you wish to check the signal ....or any other article added to the list --from a turnout to a light---you MUST EXIT the "Edit" mode. Now we see the page for editing the signal icon. Note that the format is DCC. I assigned the "cue position AND address of # 220. 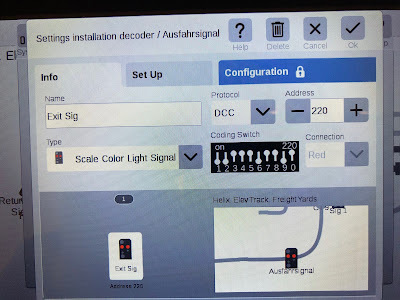 Usually the CS3 selects the correct icon for the signal automatically. Here the signal is named "Exit signal"....I eventually changed the name to Sig # 18. 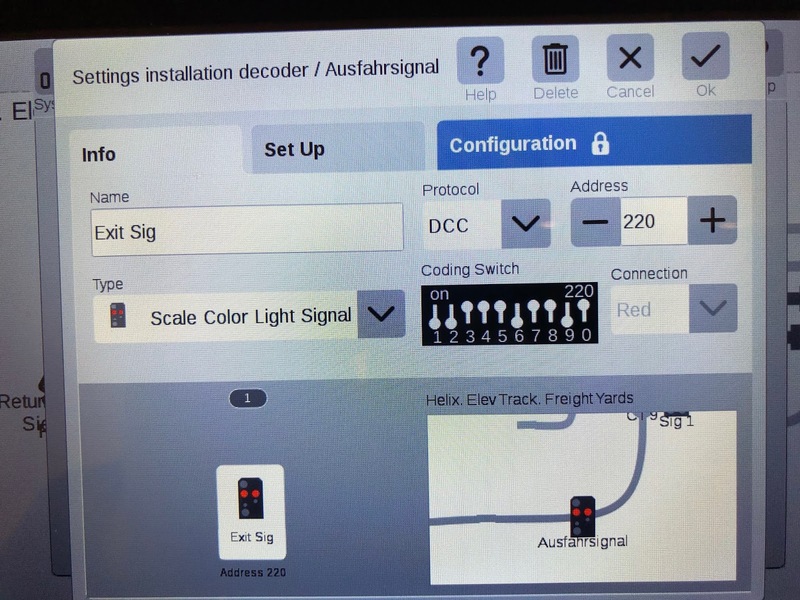 Remember to begin this "naming" process with the open TDCB ( Track Diagram Control Board) page to which the signal will be positioned on the track board. I did not document moving the icon on the TDCB to the proper position. One has to check the "Edit" tab, then check the "EDIT TDCB" and then drag the icon.....now located deep into the Right Lower Corner of the TDCB page into the intended location on the TDCB page...ie ....next to its track location ! Now our signal icon is in the proper position in the Article List cue. 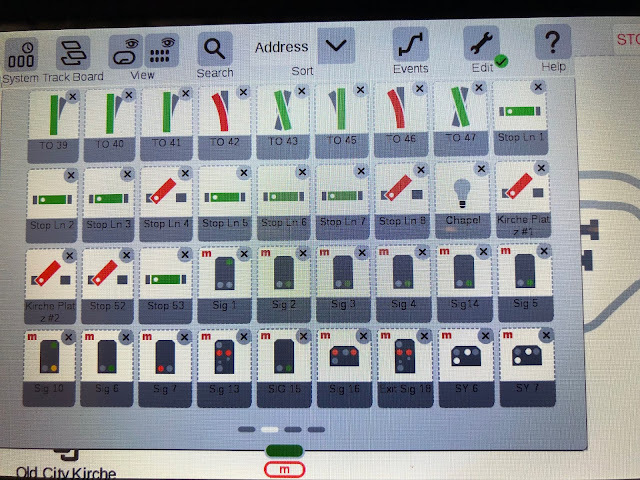 Hard to read, but it is the third icon from the right on the bottom row. .....signal # 18 ! NOTE again, that the green check mark is next to the "Edit" tab.....if you wish to check this signal, you must exit the Edit tab. 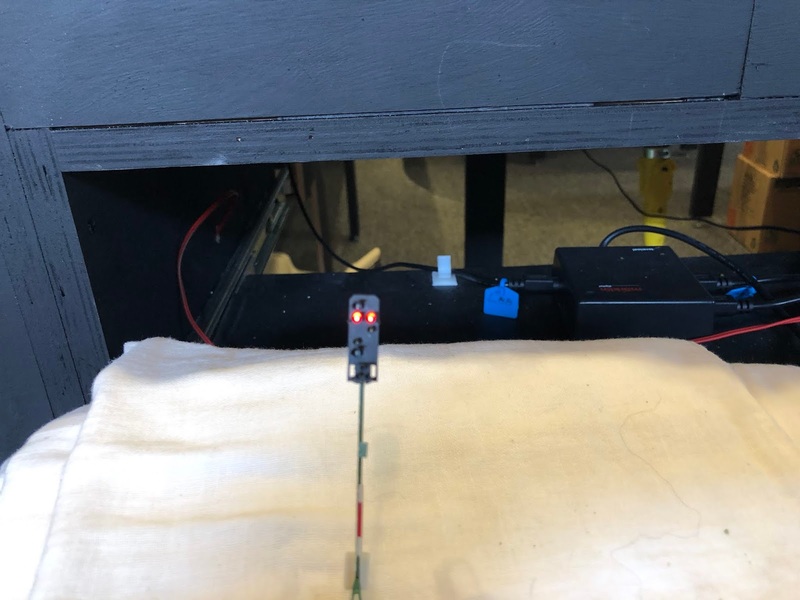 Now we can feel at least a little smug that we successfully programed a signal into the CS3 and IT WORKS ! Great...the "red" works too! 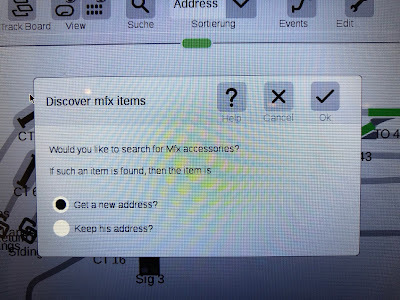 ;-) Now let's install the rascal! 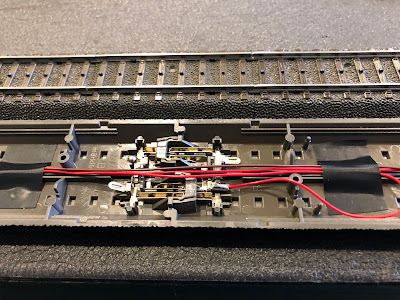 2) Wire cutters...will have to shorten the wires...plan on a mount under the C track. 4) Portable butane soldering iron, and solder. 5) Electrician's tape--to anchor the wires under the C track. 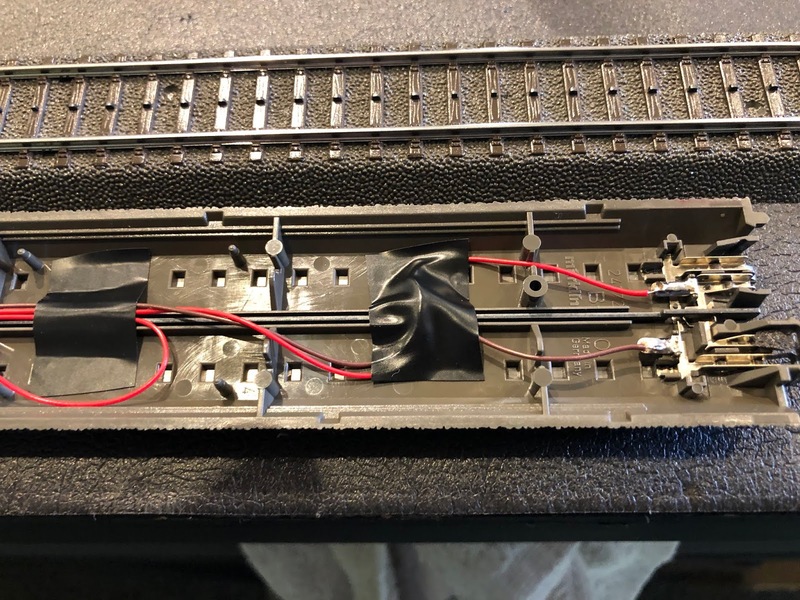 6) Portable "flame thrower" to shrink the shrink wrap around the soldered wire unions...after shortening the wires. 7) Surgical "pick up" ( tweezers ) and iris scissors. 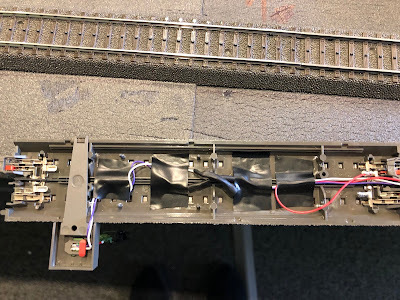 "Power wires for the signal....remember to make certain to provide power to the track on BOTH sides of the stop track .....I have been embarrassed numerous times by failing to do so...I've had to run additional feeder wires to solve the problem. 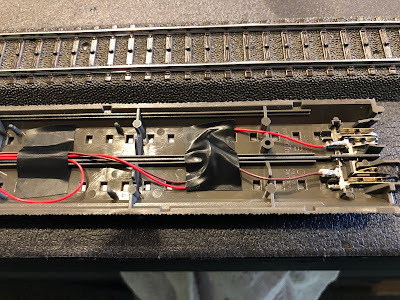 Insulation point for stop track. Red wire in lower right attached to source of power to the circuit board, and the other red wire ( not seen ) feeds the stop track. 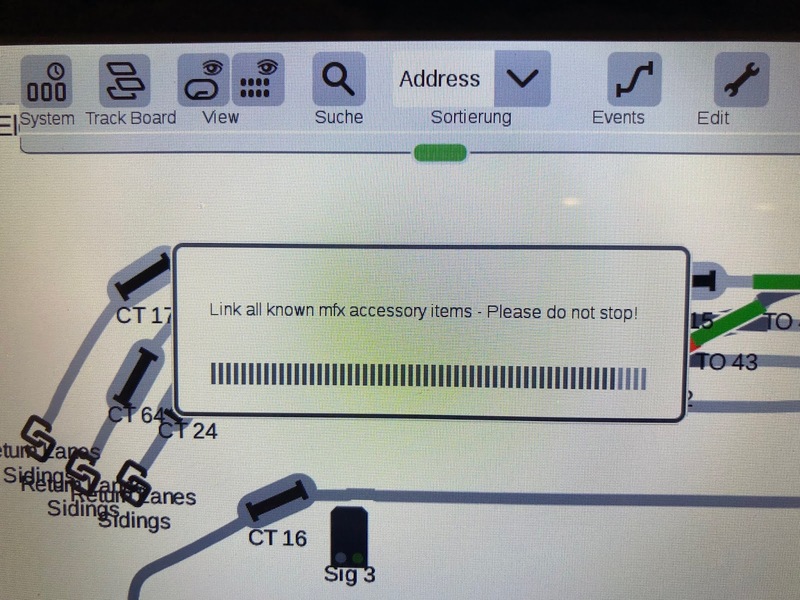 Don't forget to check the power to the "stop track" with the signal on red" !!!!! ....if the check fails....suspect your insulation points ! 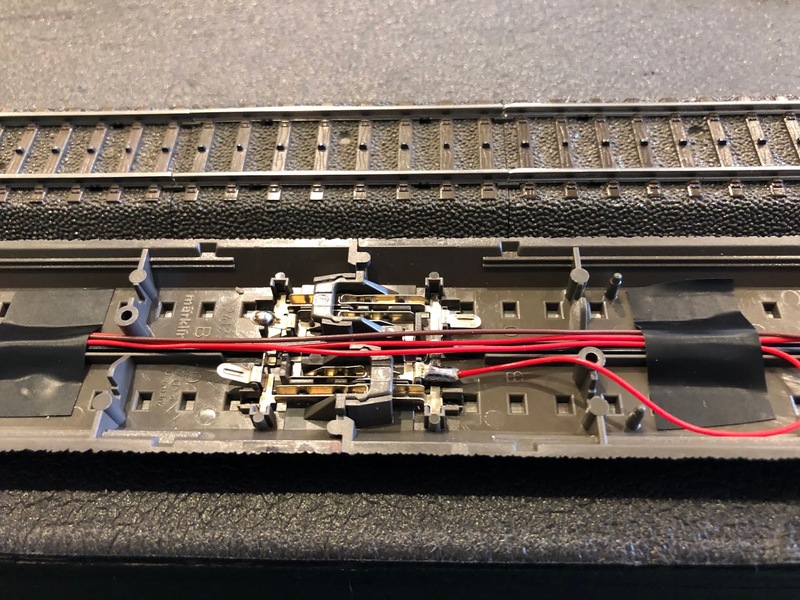 The "other" red wire for the stop track. Blue/ White wires heading for the signal on the Lt. 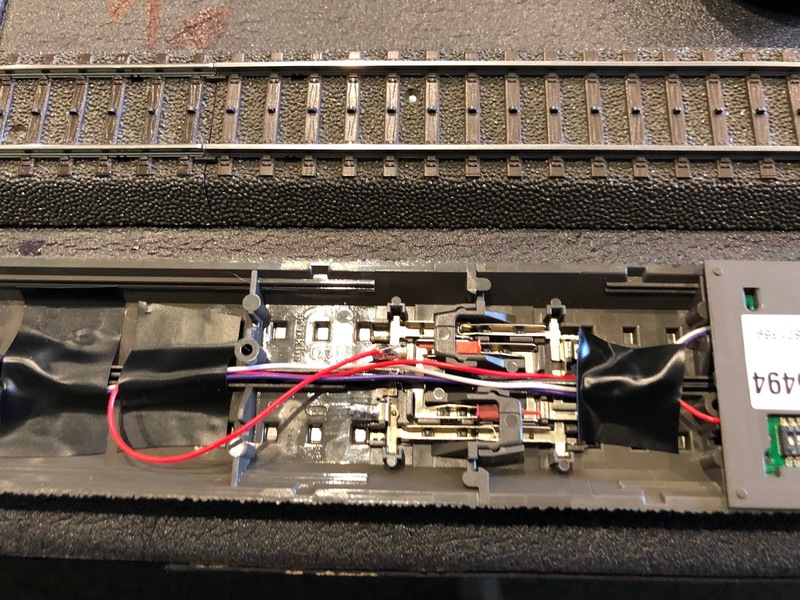 Note also the shrink wrap around the connection from the signal to the circuit board. Don't forget to check to make certain that your longest wagon can negotiate the curve and not hit the signal .....goes for Cantenary as well! 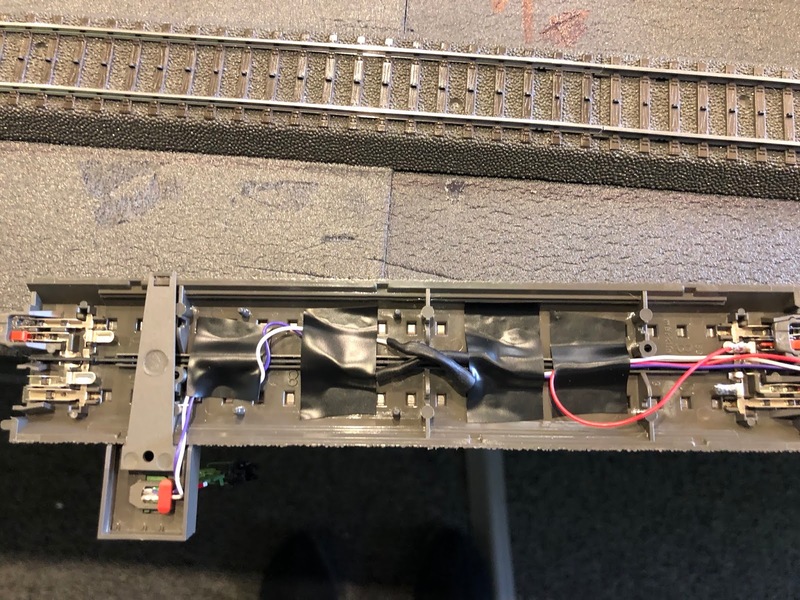 When working around signals...try this trick....provides some modicum of protection so you won't destroy a very expensive piece of equipment ! 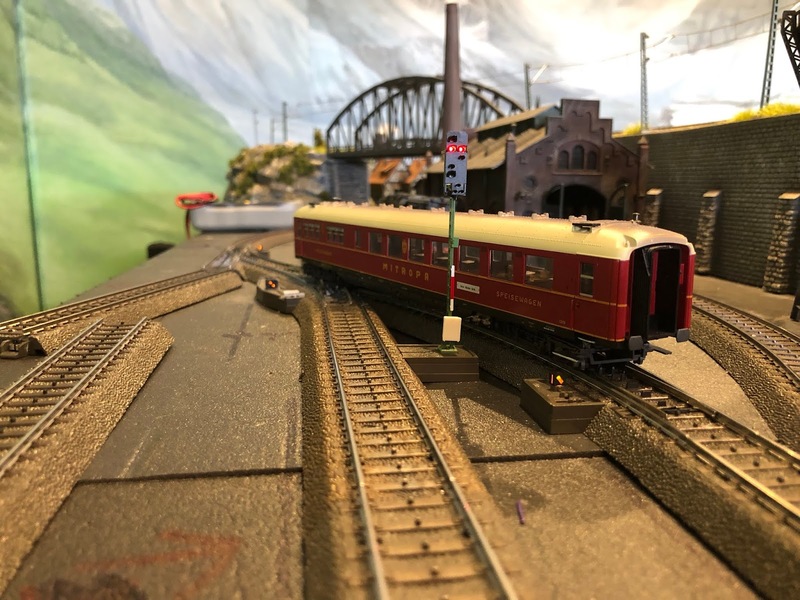 Visit our main store site for all your European Model Railroading needs. We ship worldwide! Block Signal Network Problem ---BEWARE ! Copyright 2012 Euro Rail Hobbies and More. All Rights Reserved. Powered by Blogger.